Sean was so happy with making the giraffe as our first track out project, that we repeated the activity with S for Snake as the subject. Drill a hole in approx. center of the Champagne Cork, wood and Bottle tops. Tie a knot at the end of the string (big enough to make sure the string does not slip through). You may need to melt the end depending on what type of string you use. Wrap the other end of the string with a small piece of duck tape – try to get a slightly narrow end at the tip – it makes it easier to thread through. Sean was able to thread the string through the pieces easily enough (with assistance). Start with the bottle caps for the tail (it rattles 🙂 ), then the wood pieces and finish with the champagne cork. 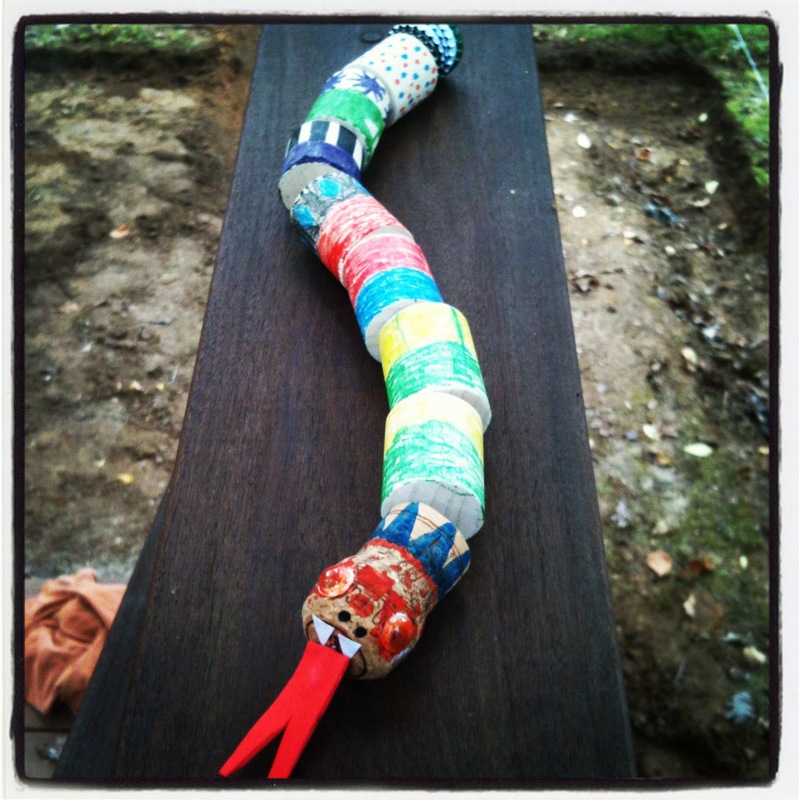 Tie another knot on the string, but you will want to bend the snake to make sure you tie it loose enough. If needed melt the end of the string on this end as well. Cut a strip of the red foam and double it up to cut the tongue shape. Take of the backing and press the tongue pieces together with the string in the middle (like a sandwich). Glue on the eyes and teeth. Use paint, crayons, markers or paper to decorate the pieces of wood. 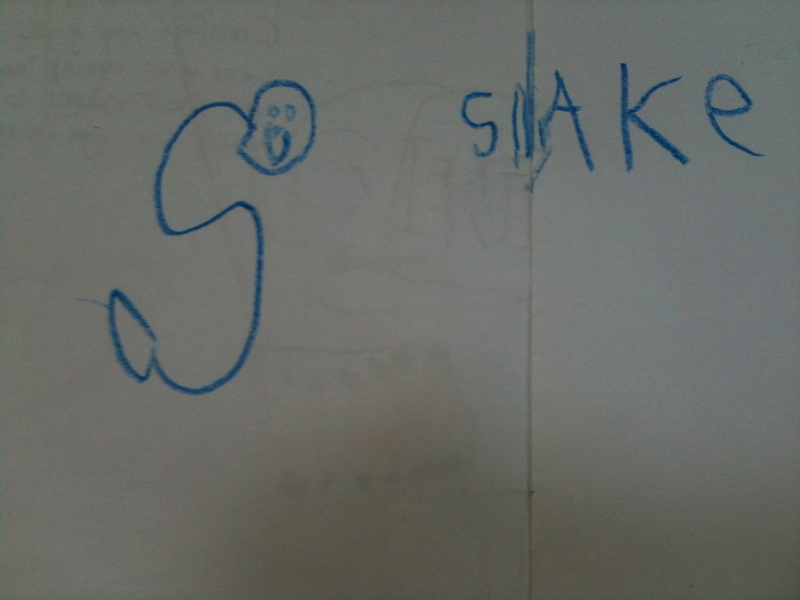 Here was his journal entry, his picture, the word snake he sounded out and wrote and his story. Now to come up with the next one….I think we will do “Caves” or “B for Bats” based on our trip to the blue mountains. 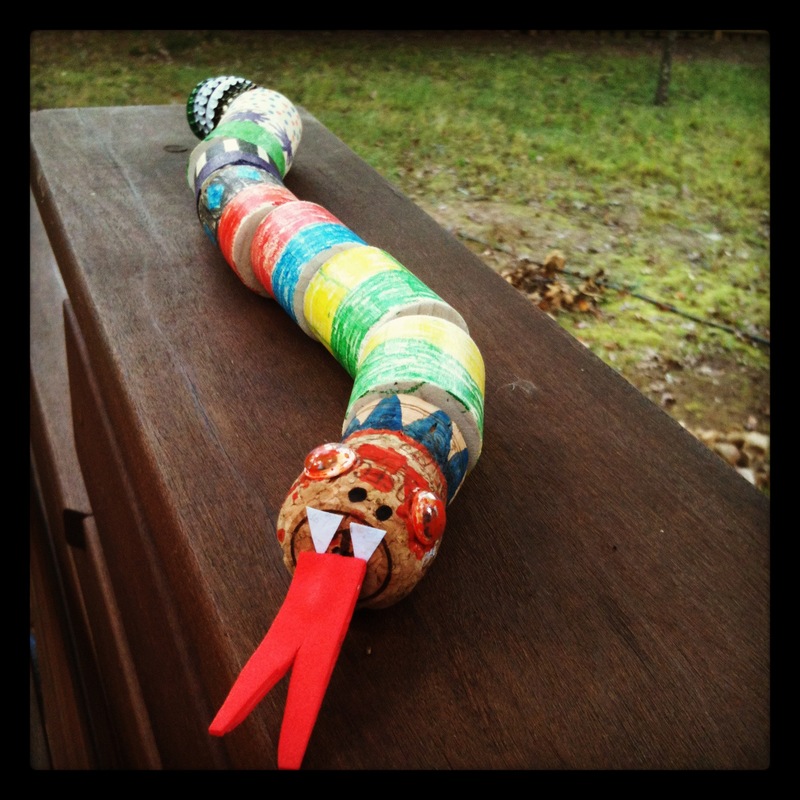 This entry was posted in Uncategorized and tagged art project, arts, bottle tops, children, corks, crafts, drawings, foam, journal, kids, kids craft activities, Letter S, paper crafts, recycling, reptiles, S for Snake, snake, track out, wood craft on October 18, 2012 by mlwilkie.